I mentioned yesterday that I was up early enough on Friday to take a photo of the overnight snow before the sun came up and melted it. In fact, that was the third day of the week that I had to be on the very first bus of the morning. Then, yesterday, which was Saturday and might therefore be supposed to be a little more relaxed, I was at the station soon after 8am and heading off to yet another early meeting. So much for the freedom of running my own business. At least it was daylight, though, and I got to watch the nimble little daredevil you can see in the top photo in his death-defying treetop performance. It reminded me of watching the red squirrels when I lived in Spain: the same quickness, agility and sense of balance. he disappears through tumbling undergrowth. a ragged cat accuses me. 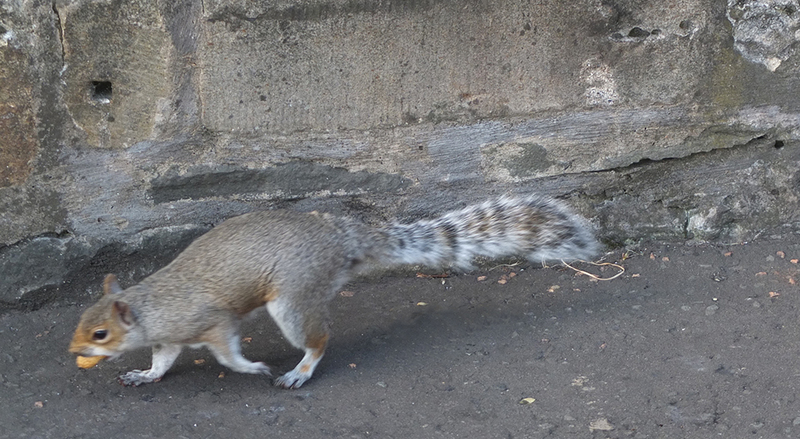 And, to end, a photo of a grey squirrel in Edinburgh’s Princes Street Gardens, where the food is presumably plentiful as long as there are tourists around and where it doesn’t require such gymnastic prowess. I doubt the squirrels there have to get up so early, either.